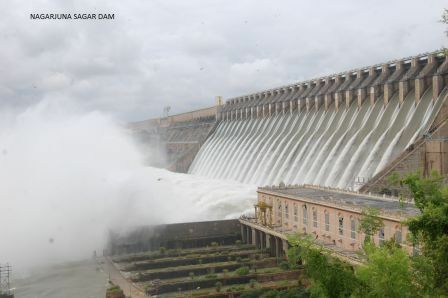 Nagarjunasagar Project is the largest and highest masonry dam in the world built between Nalgonda district of Telangana and Guntur district of Andhra Pradesh.The Project was inaugurated on 10th December 1955 by Late Pandit Jawaharlal Nehru, the then Prime Minister of India . Chute sluices : 2 vents of size 10' x 25' with sill at +450' (137.16 Mts), Operable upto +549.00 Ft Discharging 17,000 C/S at full gate opening. Diversion Tunnel : 2 Vents of size 10' x 25', Operable upto +560.00 Ft, Discharging 20,000 C/S at full gate Opening.